Easy to adjust for personal comfort using foot pressure, no bending or stooping required. 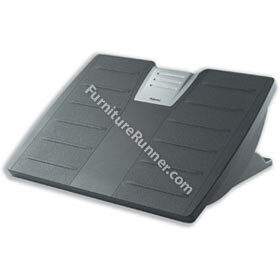 Convenient locking mechanism holds footrest in preferred position until you readjust it. Features Microban™ antimicrobial product protection to inhibit the uncontrolled growth of stain and odour-causing bacteria on the footrest. Microban™ technology is built in during the manufacturing process so it will not wash off or wear away. Adjustable height between 108 and 146mm. WxH: 445x333mm.